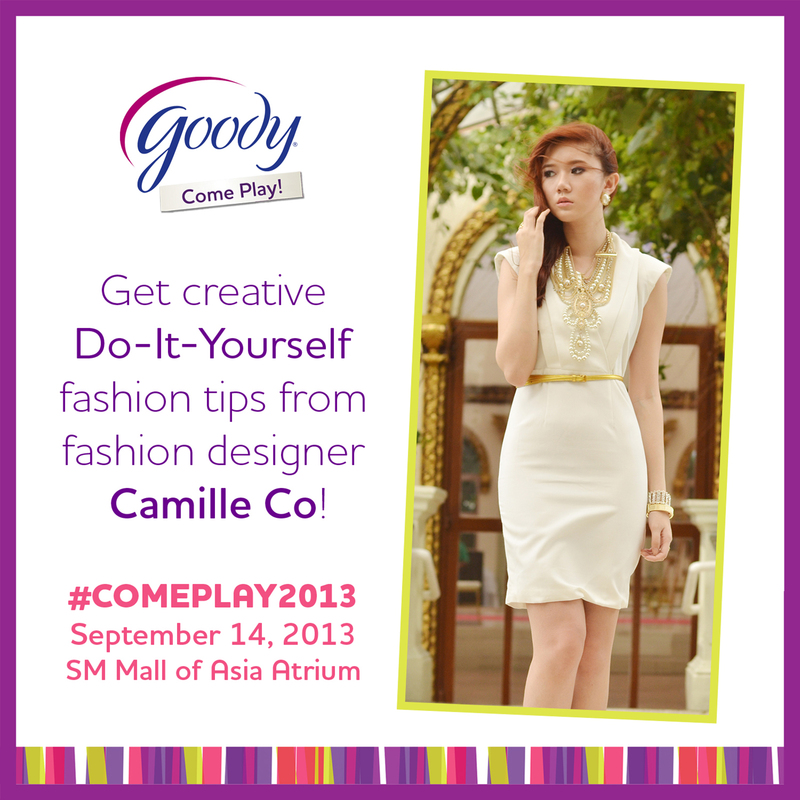 Come Play With Me And Learn DIY Fashion! It’s Goody’s Come Play event again! If you remember, I was one of the speakers at last year’s Come Play event. This year, I’m part of this fun and exciting event again but this time, my blogger besties are joining me. We’re giving talks on different topics, mine being DIY fashion. Are you excited? 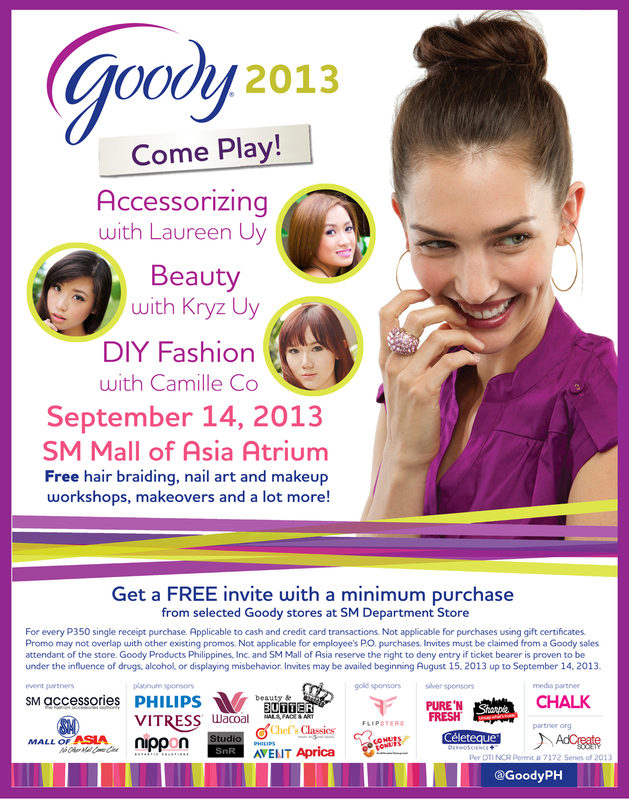 :) Join us this Saturday, September 14, at SM Mall Of Asia’s Atrium. Program starts at 2:30pm! You can get tickets to Come Play for free with a minimum purchase of P300 worth of Goody products at participating SM Department Stores (SM MOA, Makati, Megamall, Bicutan, Harrison, San Lazaro, Southmall, Bacoor, San Pablo, Manila, North Edsa, Cubao, Sta. Mesa, Pampanga, Clark, Fairview, Marilao, Marikina, Baliwag, Taytay, Calamba, Sta. Rosa, Batangas and Lucena). Hurry! Tickets are limited! P.S. If you have any DIY fashion requests, do let me know! I so wanted to go! :( But I can’t. Awwwww :( That’s too bad! omg. i have class until 5pm :(((( sana late na mag start huhu! :( what time are you going? That I’m not sure. Maybe 5? I CAN’T WAIT! I have to make up for missing the Meet and Greet in the Tomato branches :( I do hope they have another one even though it’s stated that Trinoma’s the last one :( So excited! Yes it’s the last one :( Mhaica and Kat were able to go!